I’d like to share my explorations of Netflix Crow’s new arms in the hopes of maybe stirring some thoughts and feedback. I’ve tried contacting some of the folks who bought the actual bot props as part of their Kickstarter rewards but have so far not had anyone get back to me about the measurements and attachment materials. In the meantime, I’ve used the available promo images of Crow & Hampton Yont as well as several photos I took of Grant & Crow at this year’s Live Show to figure out some sizes. I used the known width/diameter of the foam insulation tubes (1.5”) to then scale-measure the rest of the arm rods and joint spacers. It’s not a perfect way of determining the sizes, but I think the consistent measurements that I did get via this method must be pretty close (within a quarter inch or less) if not spot-on. What all the images in this post are about however, is in regards to the joint that joins the resin shoulder/lamp fixture to the arm assemblies. It’s clearly quite different than the multi-piece rod assemblies that were used with “classic” Crow. 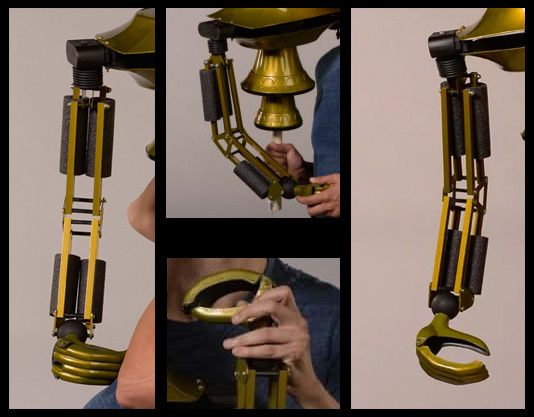 The ribbed rubber tubing now sits directly below the shoulder fixture which then gives way to the first of the lamp-arm, “triangle,” joint/bracers. The other point to observe is how much free-range movement the arms now achieve when puppeteered. That means the connection from the shoulder to the arm cannot be hard connection like a bolt, as was used in the past, which only allowed for one angle of movement (back & forth). So that means we need a new flexible, yet sturdy attachment method. Of course, whatever that is, it’s being completely hidden by the ribbed tubing. As you can see in the photos, all I’ve done is create a semi-loose plastic loop that threads through both the resin shoulder hole and the lamp joint. I’ve done this by using the smallest zip-ties I could find (0.81” diameter), pulling them only so tight so that the top edge of the lamp joint (where the zip tie will always be visible) is pulled up into the ribbed tubing, where it remains hidden, just like the screen-used Crow. As you’ll see in the video link below, this allows me the same multi-directional range of motion we observe the Crow puppet’s arms performing on screen. It’s quite secure as well. My only concern is the potential wearing down of the resin shoulder hole where the zip-tie is threaded through over time, due to friction. But for a personal prop that won’t likely see any heavy-action performances, I think this is a pretty decent solution. Over the Thanksgiving weekend and in-between eating & watching The Gauntlet, I was able to construct a fully operational Netflix Crow arm! I’ll post about the entire arm (parts & sizes) later on once I get a few more photos, but for now I’d like to address the MUCH BETTER shoulder joint connection I discovered! Yet BEFORE that… I think we need to chat about the variations of shoulder joints that have appeared. Yep, that’s right, we already get a bevy of conflicting source material to work with that’s going to force us replica builders to start making choices based on what we think we like best. -A classic, string operated jaw. 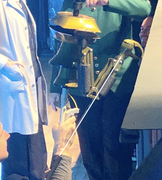 This can be seen in several of the photos- Both under the jaw heading to the neck hole and with the old, BBI-style metal ring hanging out from the bottom of his PVC pipe; As opposed to the “string-less” servo-controlled jaw mechanism that’s used in the new on-screen puppet. 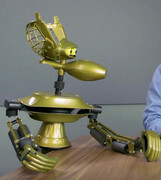 -He also is clearly lacking the puppet arm-control-rods that run up the forearms and attach to the wrist joint. -His shoulders are also clearly seen to feature the lamp joints sandwiched between two thinner spacers and bridged in-between by one wider spacer. -The number of ribs on the black, ribbed rubber tubing is seven. -We find the spacer in between those same lamp joints are no longer broken up, but contain a single 1”-to-1.25” black nylon spacer- just like the rest of the spacers that appear throughout his arm structure. This much larger width between the lamp joints made me believe that the ribbed rubber tubing used in Season 11 had to have a much larger inner diameter than the black, ribbed breathing tube we’ve all been using over the years, as you can see that the upper half of the lamp joints are tucked into the black tube. I can tell you the length between a fully spaced pair of those joints is 1.25” and the traditional black tubing is only 1.5” outer diameter with a 7/8” inner diameter. I did my best with the photos to determine if the S11 black tubing had a larger OD but it if that is the case, then it could only be less than a quarter inch larger. The black tubing would very noticeably protrude beyond the edge of the black shoulder block any larger than that- and it doesn't. Thus, the inner diameter must have been wider for this version. -The number of ribs present on the black tubing is seven. The same number that are consistently on his neck in every variant. -Just want to point out that Tour Crow has the coolest control-mechanics of any version but we’re focused on the shoulders for now… Which have the same seven ribs on the black tubing. -The “Promo Crow” spacer style is now back! The lamp joints are braced by two thin, outer spacers and one wide inner spacer. -This one features a reduced black tubing that’s only five ribs high. -The lamp joints are now spaced out in reverse: Two wider spacers on the sides and one thinner spacer in the middle! This makes the lamps joints slant into a distinctive “V” shape. So those are the variants I’ve spotted that everyone will want to consider when choosing what version of Netflix Crow they want to make. I’m sure more will appear as time goes on. We see in photos that allow us to view the connection point at just the right angle, that there are protruding from the bottom of the black tubing, what I’ll simply call, “two bumps.” They appear between the upper lamp joints and seem to not be related to the straight, black spacers that horizontally span those joints everywhere else. ...And there you have it! Not only is it the perfect connection point which allows complete freedom of movement, it’s sturdier and softer than the zip-tie. PLUS, you can see the two loops made by the ring now give us those “two bumps” seen in the photos of the real Crow puppet! Russ swapped out the old movable joints with O rings to give the arms more movement. For the shoulders on the show Crows I used only 5 rings of the black tubing instead of 7. It might give you more room and make it easier to loop your O rings to the bolt. Thanks so much for that confirmation Bob! What an honor! Well I could use these at some point. I wanted to share an update of where I’m at with the Netflix arms. I did a couple trial-runs with different lengths of arm dowels in order to test if my measuring method was accurate (which I will detail in a future post). I’ve finally settled on the what I confidentially believe to be the correct lengths which have successfully allowed me to recreate the same full range of motion and poses I’ve seen the real ones perform… Or at least as confident as I can be without being able to take a ruler to the real thing in person. I’m now in the middle of painting all the components and once that’s done, I’ll be sharing a full list of parts and measurements. But for now, I thought I’d share the method I worked out for wrists as they aren’t terribly complicated, but explaining them is going to be touch lengthy. What’s obvious from watching the show is that a puppet rod now sneaks up through the open elbow area, into a sphere and then attaches to the enlarged fanny pincher hand. It allows for general movement of the forearm and also the rotation the hand as well. I’ve seen no evidence that the hands are articulated with an opening and closing “pincher style” mechanism. They are attached with what I would assume to be the standard Split Push-In Rivets which simply allow for the finger-half of the hand to freely hang and flop open & shut. What that means for the wrist though is that the spheres which make them up must have at least one pivot point in relation to the rest of the arm, and also allow for rotation of the hands via a rod traveling straight through them. Again, I’m not saying I know for certain this was how it was done... But this way very much works, looks perfectly accurate from the outside, and I’d be quite shocked to find out they did something drastically different. Using the comparative photo-measurement method, the wrist spheres appear to have a diameter of 1-3/4” which is consistent with the spacing between the rest of the joints. I found a batch of wooden spheres at a Hobby Lobby in just this size. Any larger (next standard size up is 2”) and it becomes obviously too big and no longer fits or matches the scale in relation to the rest of the assembly seen in the photos. It can be very difficult if you’ve never drilled directly through the center of a sphere before. I’d absolutely recommend using a drill press as opposed to free-handing it. It will allow you to safely secure the shape and get a precision mark on the center point. It should also be noted these wooden sphere “beads” have a helpful way of finding their center points in that there will be two spots where, during their creation, they were held in a lathe and spun. Find them and use an awl to indent holes in them for your drills to sink accurately into. Drill this first hole completely through the sphere. 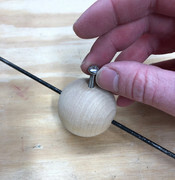 The hole should be the same diameter of your puppet rod- just large enough to allow the rod to slip easily through and spin freely without friction. As you can see in the dotted, red outlines I added, you don’t want them to go all the way through & meet in the middle. They should only go into the sphere deep enough to offer it a rotation point while not impedeing the puppet rod- which will occupy the center space. 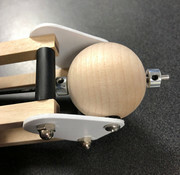 You should be able smoothly spin the sphere both on the rod and (separately) on the bolts and not have it wobble. 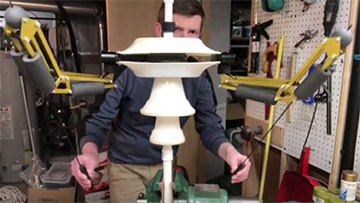 If it does wobble from an uneven centrifugal force, that’s a sign you didn’t properly drill your holes directly through the center points on the sphere. Try, try again! 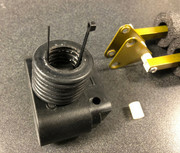 The bolts will ultimately serve as the attachment points between the styrene joints. The puppet rod (seen in my photo with temporary shaft collars to keep it in place) will eventually attach to the resin pincher hands. …Speaking of which, I’m also starting the process of enlarging a pair of the hands via the method I heard was used for the real-deals. Specifically, using an expanding resin. You can look up HydroSpan100 on Google for a full explanation and demo of how it works. In short, it will require a significant amount of time and several generations of re-molding to get them to their show size. We’re talking weeks to potentially months here actually and wouldn’t you know it… The company I bought the resin from sent me a batch that expires this coming April! So, wish me speedy luck. I’ve made silicone molds and cast resin many times before but this will be my first time attempting to work with the expanding variety. Here’s a brief rundown on how to make the puppet arm-rods. I determined the rod itself from handle to the base of the hand is 20”. 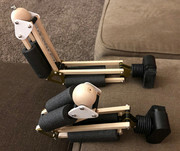 The method I’ve always seen puppet arm rods be built (and previously made myself) hasn’t changed much over the years and looking at the photos, they seem no different with Crow. Knowing that, I’m going to recommend buying & cutting yourself a pair of 1/8” steel rods at 22” to allow some working space in both the handle and the hand. Bend about a ¼” inch of one of the ends on each rod in a vice. Get yourself a length of 5/8” square wooden dowel. Cut two 5” length pieces and sand all the edges -both top, bottom, and sides- so that they are rounded enough to hold comfortably. Drill a 1/8” hole through the dead center of each dowel about an inch down from one of the ends. Use a Dremel to carve out a channel from the hole to the end of the dowel deep enough so that the bent ends of the rods can fit into the drilled hole and also sink into the channel just far enough to be below the surface of the dowel. Use a two-part epoxy glue to fill in the channels and set the rods. Cover the tops of the rods with the epoxy as well and let it cure. The epoxy comes in different cure times based on what you choose. I prefer a 5 min. set times myself but it’s available in much quicker. Once that’s set, go ahead and paint them flat black. You can then also wrap the handles in Gaffers tape to make the grips even better for handling. And that’s it! You’re good to go on what’s probably the easiest and cheapest component of the Netflix arms. It's looking pretty good so far! I’m about to post the measurements and materials I used to build these Netflix arms soon- I promise! But every recipe made to imitate another is always requiring taste-testing & refining in the kitchen before being served (how’s that for a metaphor?). I’ve been changing up a lot of the details and hardware on these things as I learn & observe more from new photos. I can’t promise they’ll ever 100% the same as the ones constructed by Puppetgarage, but I’m going to make sure they’re as darn close as I can get them (for being someone who only saw the real ones in person, in passing, at the Live Shows) before I commit to putting out my final parts list. I’m crazy happy with how these have come out! All except for one part. I’m not satisfied that the wrist spheres are matching what I see on screen and in photos. It’s clear they’re painted with a flat finish but what is harder to tell for certain, is if the somewhat grey shade they appear to be, is due to the way the light is being scattered across their flat finish or not. Case in point, I painted them first Krylon Flat Black; the same Flat Black I’ve used on all the Crows I’ve built over the years. As you might be able to tell from the photos, that just doesn’t look quite right. Compare the shade of his Spheres to the the other parts of him that are clearly black. Parts such as his shoulders, neck and the drain tube in his chest. The Spheres have always looked to me to be just a few shades lighter and my first pass coloring my own has fully convinced me that the real ones couldn’t be plain ol’ Flat Black either. Since this stuff is a Primer, it’s ultra-flat and is one of the only off-the-shelf paints on the market that’s a very, very dark grey. An almost-but-not-quite black color which is exactly what the real ones look like to my eye in photos. Since I would have to remove them again, I took a few photos that help demonstrate the method I devised to attach the Spheres to the wrist joints. On the guitar-pick-like wrist joints, I have two holes drilled large enough to freely permit the 8-32 bolts I’m using throughout the arms to slide in easily. This allows for free ambulation of the arms when puppeteering. However I made the hole I drilled in the joint that accepts the shorter bolts for the Wrist Sphere smaller. Small enough to permit the bolt but not the threads, so that those two bolts must be threaded into the styrene joints with a screwdriver. This makes the joints hold the bolts firmly in place. The Spheres can then rotate and spin freely around the fixed bolts. -Rust-oleum Flat Black- For all interior parts of Crow; Inside the soap dish, Floraliers, etc. But if anyone else knows of a reason why any Crow replica and the latest iteration of the Testors Gold Metal Flake paint should not be wed, I would ask that you please, not forever keep your peace and let me know! I'm closing out 2018 with a body assembly and articulation test of the Netflix arms! Hit the link below for a video. I've been experiencing an unwanted but unavoidable delay in getting to Crow's new hands. So in the meantime, I think it's time I shared my specs for the arms so you can get started on them for yourselves if you're inclined to do so! 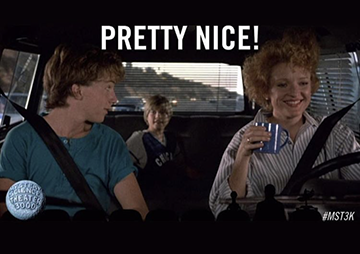 I cross-referenced those with other images of Crow and found the results consistent. Could they still be slightly off? I'm afraid that in using this method, one can never say with 100% surety these measurements are flawless. It's not a good way of getting tiny, specific results. For example, determining smaller fractions like 1/8"s or 1/16"s. But since I find these bots have rarely used fractioned measurements lower than 1/4" in the scratch-fabricated parts of their construction in the past, I feel fairly confident in these findings. My Netflix arms look pretty dang spot-on to me. Plus all the found parts that have to work in conjunction with the pieces I fabricated from raw materials also worked together perfectly. NOTE: This is a list of pieces required for ONE arm alone. All listed quantities must be doubled to make TWO arms. ALSO: This recipe will give you the parts to make arms that are in the configuration of "Tour Crow" and "Promo Crow" which I chose as my personal favorite to replicate. See my second post in this thread for specifics on what makes them different from the other observed variations which you may find you prefer instead. * Holes drilled in the styrene which will brace the wrist spheres must be smaller than the 3/8” bolts so that said bolts can be securely threaded into them vs. the other holes that will be drilled out larger to allow the longer 3/8” bolts to loosely slide into them. I personally recommend fabricating your own styrene versions as opposed to the resin ones as they will be much stronger and less prone to cracking when you thread the bolts in and out of them repeatedly during construction. I have also been able to determine the measurements and parts for making Crow's new Netflix legs. I'd like to put them to the test in prototype form first though to make sure they're working and look correct. Happy building!